We are inspired by characters, full stop. They can be animals, people, fictional or real, as long as they are fascinating and have something to say. Strong, beautiful, flamboyant woman are a joy to study, to see, to meet, to admire, and this print pays homage to a few of them specifically, and to all in spirit. Rare bird focuses on sensational women past and present, and is named after British fashion stylist extraordinaire Isabella Blow (her husband used to refer to her as a rare bird). We decided to play with the literal/abstract interpretation of the term ‘rare bird’ and made all the woman into actual birds that we felt matched their style and personality. 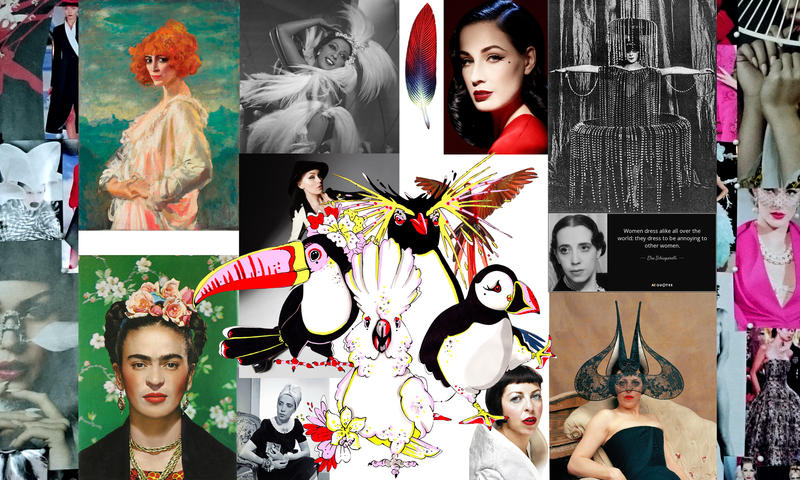 The cockatoo Issie represents Isabella Blow, the toucan Frida represents Frida Kahlo, the penguin Luisa represents Marchesa Luisa Casati, and the puffin Dita represents Dita Von Teese. All women who continue to bring us joy, glamour, art and inspiration through their legacy or continued work. We hope the characters will charm you in your everyday encounter with them, and that they bring an element of sass and glamour on behalf of their namesakes.